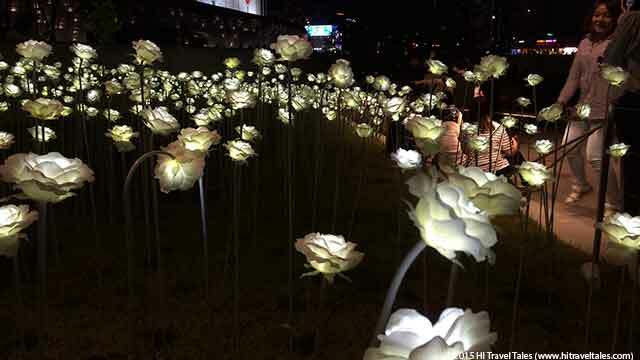 Especially now that the LED Rose Garden exhibit has been extended to run through at least February 2016. 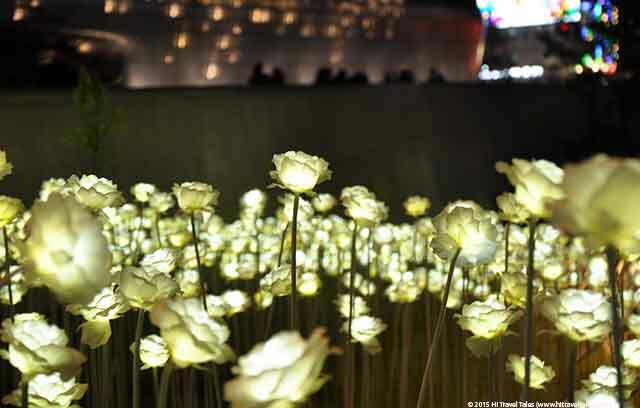 More than 25,000 illuminated LED Roses fill the gardens and lawns of the Dongaemun History & Culture Park at the Design Plaza, so once the sun goes down and the lights go on, it’s a sensory explosion that can hardly be matched. 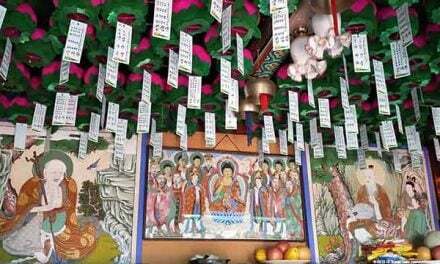 The best part, of course, is that this is a Seoul experience that doesn’t cost a cent. HITT Tip: This place is easy to get to. Take either the 2 (green circle line), 4 (blue) or 5 (purple) subway lines to the Dongdaemun History & Culture Park station. Take exit 1 and pop out into the plaza. 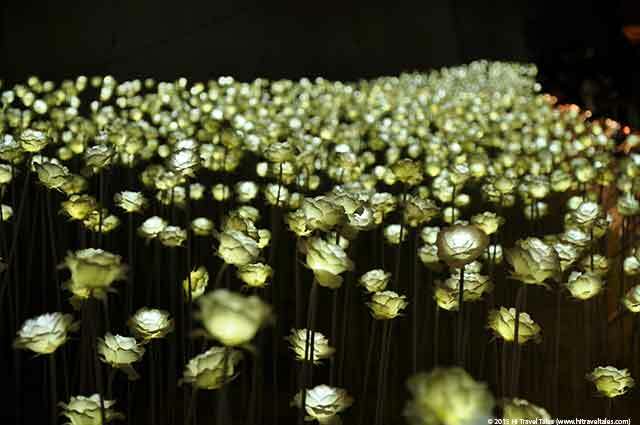 Take your camera and your tripod, forget the flash, and be prepared to wander and enjoy the breathtaking sea of artificial white roses lit brilliantly by LEDs. Move to various angles for full appreciation. Take an hour. Or even two. Since the lights stay on late, you can enjoy an evening out or dinner and cap off the evening with a stroll through the garden. The Design Plaza LED Rose Garden was first lit in April 2015 (The plaza itself just opened in 2014), and we had the pleasure of a visit soon after that. Since it is such an attraction, be prepared for crowds. But everybody seemed so awestruck by the sight that there was only a polite and muted buzz so you really could just breathe and enjoy, feeling a world away from the craziness that can be Seoul. 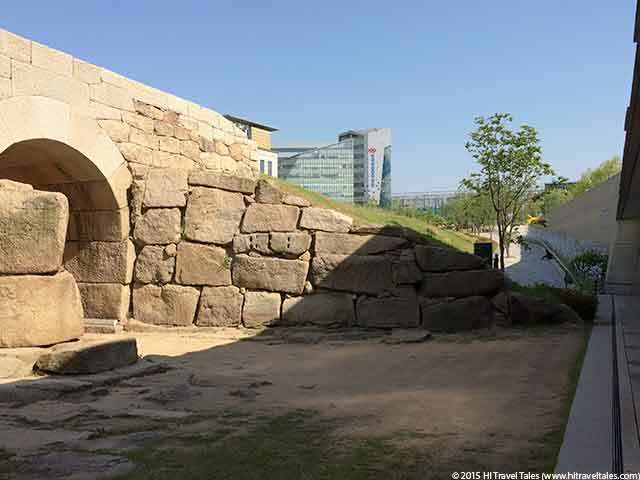 Besides the spaceship-like Design Plaza main building (which is said to be the world’s largest asymmetrical building), the site also houses part of the old Seoul fortress and wall, including a continuing excavation site with remains from the Joseon Dynasty that were all discovered during construction and thus incorporated into the site. There are of course other exhibits, art halls, history halls and design galleries with varying admission prices. 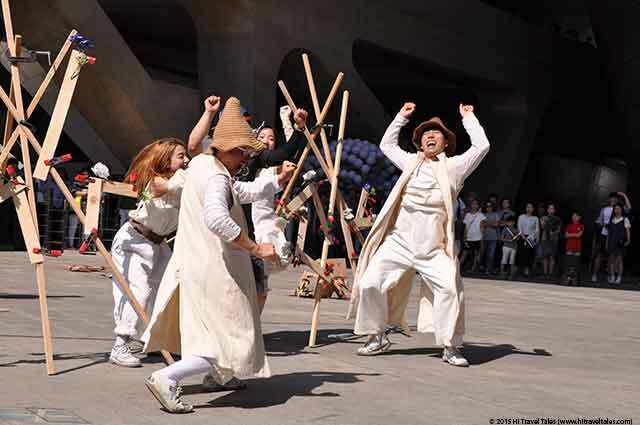 There is also any number of events and free performances, as well as farmer’s markets and arts and crafts fairs. In fact, really, the plaza is a beehive of activity most any time, which can get especially crazy in March and October during Seoul Fashion Week. 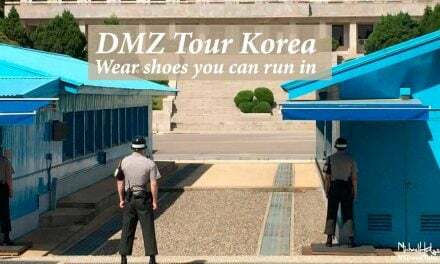 Once you’ve had enough of the plaza itself and whatever event or show is going on, don’t forget what Seoul is practically most famous for – shopping. Shopping at all hours of the day and night. Shopping in elite boutiques and malls. Shopping along streets. Fabric, socks, toys, souvenirs, food, you name it. Just shop. HITT Tip: Need a clean and free WC? This is your place! 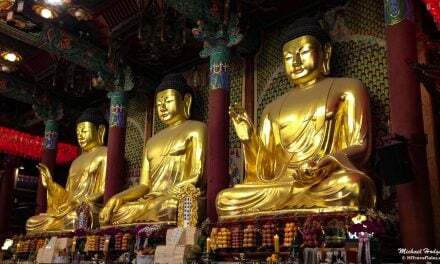 Even if you are just passing by and feeling desperate (Seoul is not the easiest place to find a break), you can walk right in and find the relief you seek. Heads up! 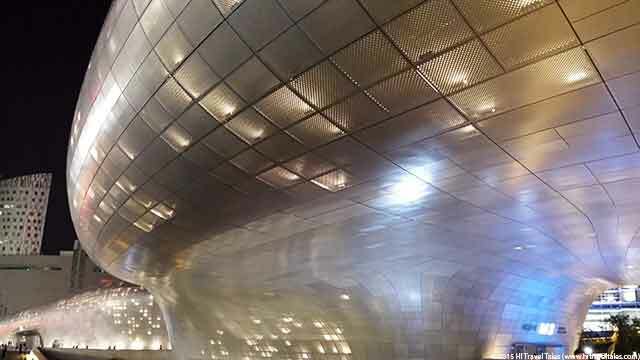 This information on Dongdaemun Design Plaza was accurate when we published it on HI Travel Tales, but, as we know, traveling is all about changes (and inflation, sadly). Please be sure to confirm prices, transportation schedules, hours of operation, safety and health considerations, request for perfect weather during your entire visit, and any other important details before your adventure.